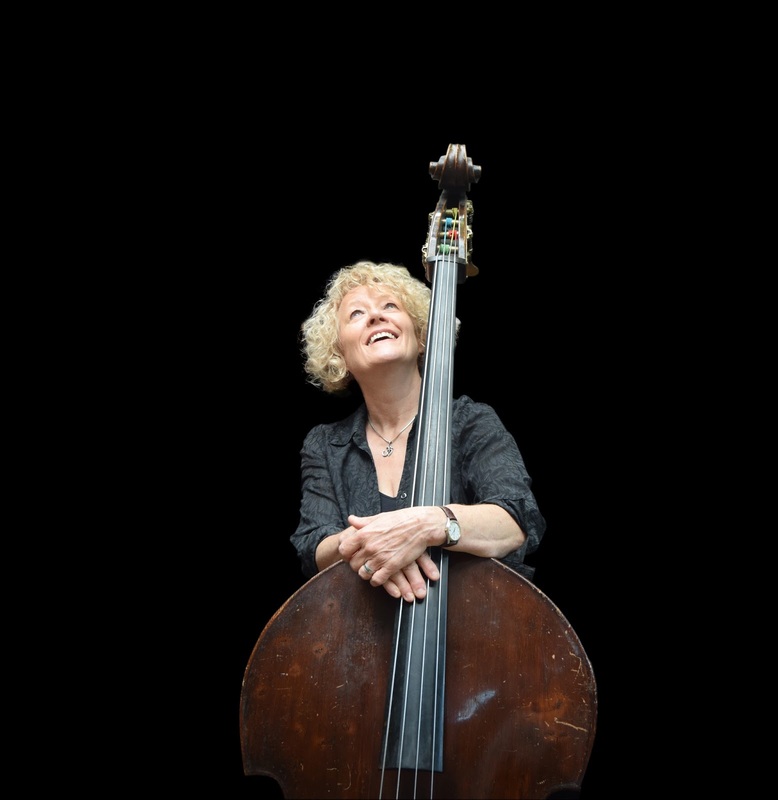 Bassist ALISON RAYNER has a tour coming up with her quintet, ARQ, with Deirdre Cartwright on guitar, Steve Lodder on piano, Diane McLoughlin on saxophones and Buster Birch on drums. She talked to Alison Bentley about her roles as musician, composer, bandleader and tour organiser. LondonJazz News: You’ve recently finished a 30-date tour, and you’re about to start a new tour. Will the music be from your new album, A Magic Life? 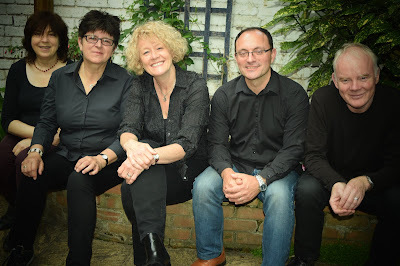 Alison Rayner: I’m currently working on what will be our third album and these tour dates, including the Soho Pizza Express on 21 February, will feature some of this new material along with music from A Magic Life and August. My pieces are about places, events, always personal experiences. For example, one of the pieces on A Magic Life was about being in India – the rhythms, sounds and magnificent elephants. And a new piece invokes Australia, where I was last year – the hot sun, orange earth and sounds of the bush. I love creating atmospheres and audiences often comment on the accessibility of the music – as well as its intensity and depth. I love the spontaneity of improvisation in jazz but I grew up with groove-based pop, soul and funk in the '60s and '70s, later hearing more acoustic folk, melodic world and classical themes; my pieces reflect all these influences. Having received such great reviews for A Magic Life and really enjoying what must have been around 35 dates touring the album, I’m looking forward to developing new music and introducing ARQ to a wider audience in 2018. I’ve never really had a plan – it’s been organic. LJN: How do you create such a positive atmosphere at your gigs? AR: Strangely, we’re told that a lot! We’re playing original music which is personal to me, like songs without words. There is always a story in the music, so I try to share that. I like it when musicians tell you the reason why they wrote a piece – what the feeling was behind it – it makes it more accessible. My pieces are written about things I care about and audiences say it makes them feel more engaged in the music. And as a band we’re very communicative – we are friends and this resonates. We’ve played together for a long time and this comes across when we’re playing. We have fun and it’s a bit like hosting a party where you want everyone to feel welcome and included, draw them into the music. LJN: Has the band’s personnel influenced the way you write? AR: I always write with them in mind and they are amazing! I am very lucky to have four inspiring players who are also extremely supportive. It’s lovely when they like a piece I have written and they often have great ideas to contribute to its development – I’m lucky. LJN: Tell me about your new tour. AR: We’re returning to Birmingham Jazz first – lovely people there – then it’s first the time for us in Shrewsbury; we then return to the Pizza Express in Dean Street – such a great London venue. We sold out in June and I’m hoping for another capacity crowd there! Chichester Jazz Club will be a new one for us and then a return to the lovely Oxford Spin. It’s great to have a run of gigs, to build up the momentum and vibe. LJN: Then London at the Vortex, Bromley, Poplar... and the Naturist Jazz Festival? AR: That’s a good one! They have a great jazz and real ale festival in Orpington. Fortunately, there’s no pressure to strip off, though I guess it wouldn’t be so bad for the drummer or bass player… They have a real crowd of jazz enthusiasts there. I’m really pleased that ARQ are included in Swanage Jazz Festival in July as well – guitarist Nigel Price has organised it for the first time and it looks like a terrific line up. We have a gig in Hamburg in September, so I’m building other dates around that. When we toured in the '80s with the Guest Stars, we had some of our best audiences in Germany. European audiences are very open and appreciative so it will be fantastic to introduce ARQ to them. In November we have dates in the North, including Newcastle – and Scotland for the first time. I’m half Scots, with family there, so this has personal importance. LJN: How do you organise a tour? AR: With difficulty! Admin’s not my forte but it’s necessary and time-consuming. When I toured in the Guest Stars in the '80s, I was (just) the bass player and I don’t think I fully appreciated the work involved in the organisation. We toured extensively for five years, playing loads of international festivals, clubs such as the Blue Note in New York and were the first British band to headline Ronnie’s. Now I know it is quite a process: contacting venues and promoters, following up, negotiating dates and fees, then on to the practical arrangements such as travel and accommodation. We’re not so young now and we do like our comforts! LJN: You don’t sleep in your car then? AR: We certainly don’t! AirBnb has been a revelation. Hotels are expensive and if we have a few dates in a particular area it’s nice to be able to come and go, cook a meal, return to the same place each night. It also means you can have a lie-in! Touring is the most relaxing part for me and that’s when all your admin and organisation pays off. You can play! What I find most tricky is chasing after gigs. You can’t always get hold of people and they can’t always get back to you straight away. It can feel disheartening and sometimes it feels like you’ve not done enough. I try to keep a sense of perspective and keep on with what is positive – and not worry about the rest. LJN: How important is funding? AR: Unfortunately, it’s extremely important. Many jazz clubs are run by volunteers and exist without any support. They can find it hard to pay the sort of fees we need. The demise of Jazz Services has been awful for everybody. Their National Touring Support Scheme was great – it gave you a bit extra so you could supplement the fees, pay for flyers or hire a van. Jazz Services supported the recording and touring of my first album August in 2014. We also received Arts Council support in 2016 towards some of the recording and touring costs of A Magic Life; and additionally, our ‘Friends of ARQ’ generously sponsored the first run of CD manufacture. Funding is highly competitive and jazz is not properly supported here, unlike other European countries. There is a small pot of money – and many artists needing support. It’s a tricky business – we could all do with more money in the jazz world! LJN: How important is social media? Just heard their wonderful gig at the Traverse Theatre bar, organised by the lovely folk at Soundhouse. Great music and a terrific atmosphere.